Recreational and utilitarian bicycling is experiencing a resurgence in cities across North America, including Toronto. The growing interest in cycling has prompted events like Bike Month—a month-long celebration of cycling in Greater Toronto and Hamilton that kicked off on May 30th. Cities worldwide are being forced to re-examine their infrastructure. Biking enthusiasts and motorists are demanding more bike lanes in their communities and on main thoroughfares, prompting Toronto to develop a 10-year plan to expand its cycling network. Why has cycling become so popular? Because cycling offers numerous health and environmental benefits. Cycling is a fun physical activity that offers countless health benefits. Yet, it is easily-accessible to people of all ages and fitness levels. Most of us learned to ride a bike as children. Once learned, it’s a skill you never forget. This makes cycling ideal for children and adults. Based on the type of bicycle and the course chosen, cycling can be relaxed and easy or high-energy and intense—making it suitable for everyone from beginners to advanced riders. Cycling engages all the major muscle groups, while putting very little strain on joints and muscles. The heart and lungs also get a good workout, improving cardiovascular health. Continued cycling increases stamina and strength. In just a few hours a week, this low-impact cardiovascular exercise can improve health, lower stress levels and reduce feelings of anxiety. Regular cycling can also serve a vital role in an overall weight loss or healthy weight maintenance regimen. As Westerners, we spend hours seated at desks, on the couch in front of the television and in our cars while commuting. A sedentary lifestyle puts increased strain on joints and muscles employed while sitting, causes unused muscles to shorten and encourages stiffness in underused joints. Utilitarian bicycle riding—for transportation—converts the sedentary commute to local shops or work into active transportation which promotes good health. Utilitarian cycling also benefits the health of the environment. Nearly 30% of Canadian greenhouse gas emissions stem from the transportation of people and goods. Therefore, reducing transportation emissions has become a key part of Canada’s goal to diminish greenhouse emissions by 30% by 2030. Active transportation—walking and cycling—can help us get closer to that goal. Motor vehicles are a major contributor to smog—an unhealthy mixture of air pollutants and other particles which can be irritating to the lungs and aggravate various health issues, like asthma. When we opt for active transportation like cycling, as opposed to starting up our vehicles, we help reduce smog and greenhouse gas emissions. There is a growing push for walkable communities as a strategy for reducing the burden placed on our environment. Walkable communities offer the perfect setting for recreational and active transportation biking. Perhaps you’re ready to embrace Canada’s rapidly expanding cycling culture, but an overflowing garage poses a serious bicycle storage dilemma. Fortunately, there are a variety of smart, sleek garage storage options for your bicycles and cycling equipment. 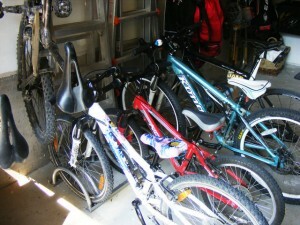 For many homeowners, storing the family bicycles in the garage becomes an either/or situation. Either the bikes get stored in the garage or the vehicles do. When improperly stored, bicycles stored in the garage can scratch or dent vehicles or be accidentally run over. The bike might also be damaged if it falls over. Serious bicycling enthusiasts make a substantial investment for bicycles and cycling equipment. Investing in a workable garage bicycle storage option will protect your investment in your bicycle, your vehicle and your garage. With a wide variety of creative garage bicycle storage options available, it is easy to find the one that fits your needs and budget. 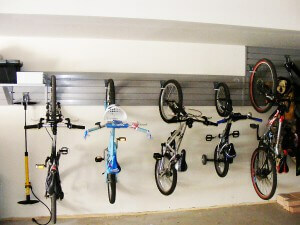 Schoolyard style bike racks are easily placed near the back garage wall, allowing bicycles to be parked in a neat, orderly fashion. This style of rack is easily put in place. However, it has a large footprint, so it is often favored by those who use all or part of the garage for bike storage during summer months. Horizontal wall bike storage relies on a wall organizational system—sturdy, durable panels that work with complementary hooks, shelves and baskets to store a range of items. 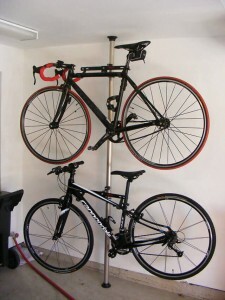 Bikes are stored flat against the wall from hooks placed at the desired height. This makes it relatively easy for each family member to remove his or her own bike. 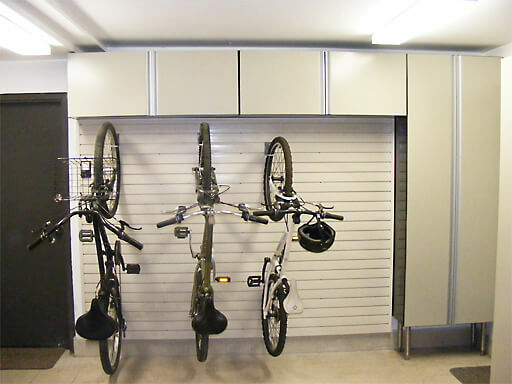 Vertical wall storage also works in tandem with a wall organizational system, but bikes are stored vertically. The bikes protrude further from the wall. However, more bicycles can be stored in the same space. Many find this storage option aesthetically pleasing. However, it can be more difficult for small children or those with limited arm strength to hang and retrieve bikes from the wall. 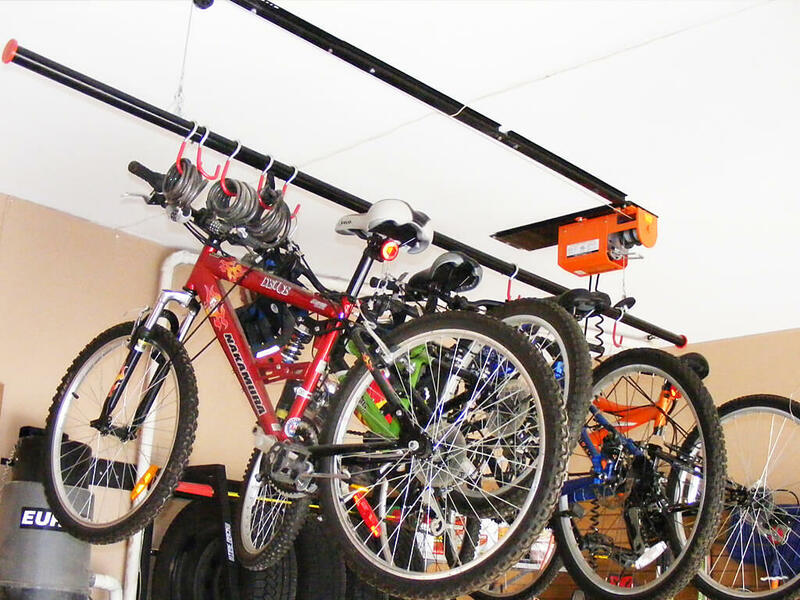 Overhead bike pulley systems come in both manual and motorized varieties. This storage option makes use of wasted, overhead space and reclaims valuable floor space. Depending on the placement of the rack, vehicles may need to be moved to store and retrieve bikes. Baskets, hooks and shelves can be hung at various points along the wall organization system panels to store bicycle helmets, water bottles and other equipment. For a more in-depth look at each style and tips on selecting the right storage option for you, review Reclaim Your Garage with Creative Bike Storage Solutions. Are you ready to embrace the Canadian cycling culture? Learn the cycling laws and safety rules, check out an ongoing list of Ontario cycling events, then discover the top cycling paths in the Greater Toronto area. If you’re in the market for a new bicycle, save the date for the Toronto International Bicycle Show’s Fall Blowout Sale on October 15th. 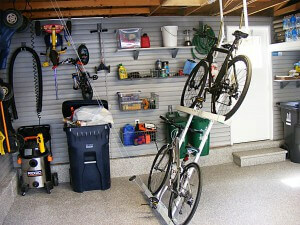 Contact Nuvo Garage to find the garage bicycle storage option that’s right for you. Toronto is the proud host of the 2015 Pan-Am games this summer. Fans have been thrilled to watch their favorite athletes with several Canadian gold, silver and bronze medals already tucked away. No matter what your sport there is sure to be some nail-biting competition. For many Ontarians who grew up along the shores of the Great Lakes or spent time camping in Muskoka, some of the most anticipated events are the canoe and kayak racing. There are few Canadians who have not spent at least one afternoon in their life paddling their worries away, so you can be assured these events will be among the best attended. If you are a fan of these sports, the following are a few things you need to know about the events, the equipment, and how to store your new boat. 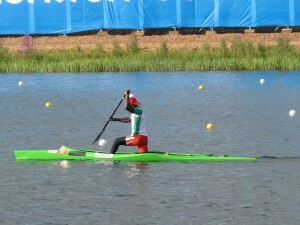 There are two events for kayaking and two for canoeing, and both have men and women competing. The first is a sprint, a fiercely competitive event where the first one to the finish line wins. This year, the sprint events will be held in Welland at the Flatwater Centre. The second is the slalom, which is super exciting. It is much more than just going around flag posts. The slalom courses for both kayak and canoe are done in raging white water. It is literally a thrill a minute as upsets and almost-upsets can change the lead in a heartbeat. The event will be held at the Wild Water Reserve in Minden. Canada is putting its hopes on one of our premier canoeists / kayakers, Olympic medalist, Mark de Jonge for the sprint. The nation will also have an eye on Jazmyne Denhollander, our Canadian women’s hope in the kayak slalom. Without a doubt, Canadians will be watching their every move, not just for racing, but to also check out the latest and greatest equipment. Gone are the days of canvass boats and wooden paddles. Today’s kayaker or canoer is looking for something a little more high-tech. They want sleek, they want light and they want what the top athletes are using. You don’t have to be an Olympic level athlete to enjoy the benefits of top-of-the-line equipment; many recreational boaters are also looking for high-end products. Today’s competitive kayak is a far cry from the plastic model you piloted at summer camp. It is sleek, strong and generally made of polyethylene or carbon-Kevlar (the same material as bulletproof vests). They are more maneuverable and designed to minimize wind resistance. Of course, sprint Kayaks need to be more streamlined and slalom kayaks need to be tougher. Try to determine which type of kayaking interests you and pick your equipment accordingly. At first glance, a competitive canoe can be mistaken for a kayak. They are narrower and shorter than those you see on the lake and they have a spray skirt. 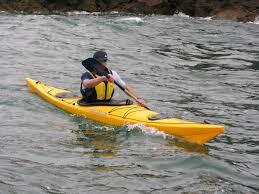 Again, like the kayaks they are made out of lighter materials such as Kevlar and carbon fiber. In fact, they have gotten so much lighter that the Olympic committee put in minimum weights for these boats to keep the competition fair -10 kg for a single canoe and 15 kg for a double. If you are just looking for a regular touring canoe or kayak, you can easily find one for under $1000 but if you want high-end competitive boats, you are starting at least around the $3000 mark and depending on the make and customization, you can easily spend ten times that amount. A high-end canoe or kayak is an investment so you need to ensure you take care of it properly, and that means storing it safely indoors during our Canadian winters. If you find yourself hesitating to buy a high-end canoe or kayak because you don’t have the room to store it, then think again. There are a number of convenient and innovative solutions to storing these awesome boats. Simple and secure. Padded wall mounts hold the boats in place during the off-season. They are secure, easy to operate and can be used to store more than one boat. 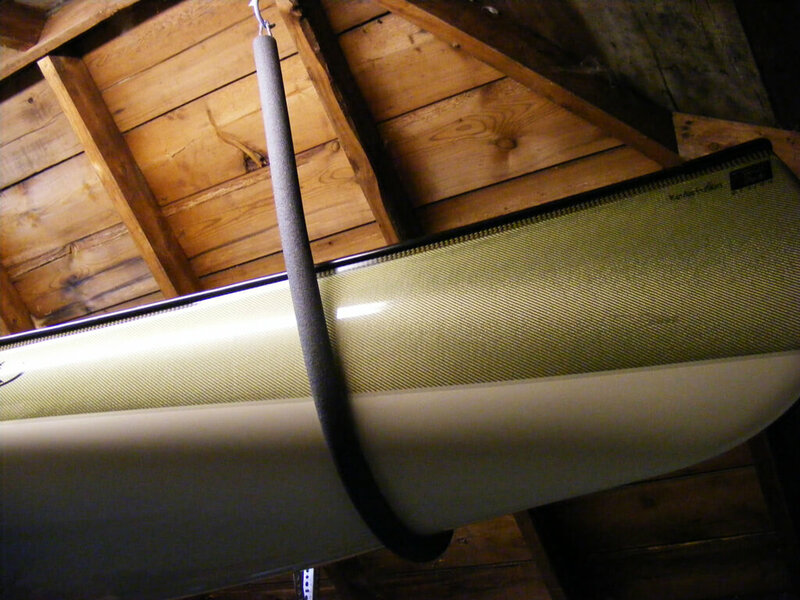 If space is at a premium in the garage, consider using a sling to keep your canoe or kayak up off the floor. Look for heavy-duty stainless steel chain that is wrapped in foam. 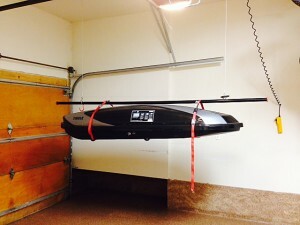 The sling system also works great for lowering the boat right into a waiting vehicle. No matter which solution you think might work best for you, the smart idea is to consult with a garage storage specialist. He (or she) can tell help you find the right solutions to keep that high-end competitive boat in the best shape. Therefore, if you find yourself idling in the stalled traffic this summer, wishing you had a third person for that HOV lane, don’t despair. You can use that time to daydream about the new kayak or canoe you are going to buy at the end of the Pan-Am games. It will be sleek, light and will be safe and accessible thanks to your new garage storage system. With the Chinese New Year approaching, many feng shui practitioners are busy cleaning and preparing their homes to get rid of bad chi (energy) and usher in good luck before the New Year arrives. Feng shui is an ancient Chinese art and science that recognizes the impact our environment, and the objects in it, can have upon us. Often regarded the art of placement, feng shui is literally translated “wind and water.” Feng shui strives to balance the five elements—wood, water, fire, earth and metal–and the energy (chi) that flows from all things—living and inanimate. 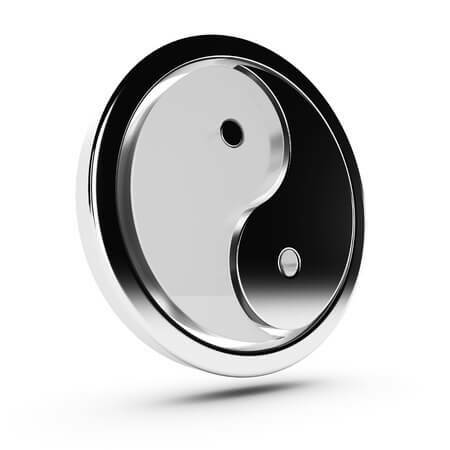 The goal of feng shui is to create harmonious environments that reflect one’s internal environment by improving the flow of chi throughout the space. Optimizing the flow of chi in one’s home or office can enhance happiness and one’s financial and romantic life. This is accomplished through the use of colour and the mindful placement of objects in one’s living and work spaces. While you may be incorporating feng shui into your home, have you ever considered incorporating the principles of feng shui into your garage? This ancient art of placement can be used to create a garage that welcomes positive energy into your home, rather than blocking it. Below are five tips for using feng shui to enhance the flow of chi in your garage. Have you ever tried to work in a cluttered space and found it difficult to function or think clearly? That’s because clutter represents stagnant energy, which can zap your personal energy. This is true of clutter whether it be in an office, bedroom or your garage. 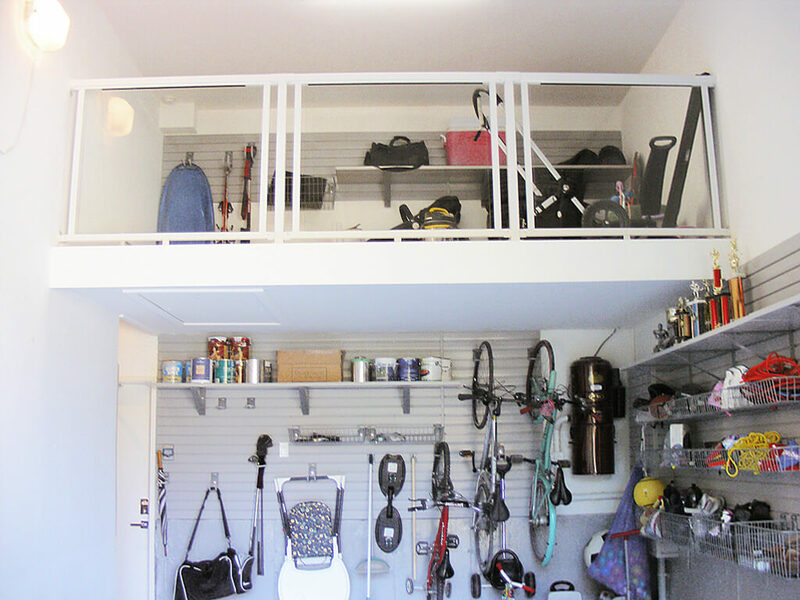 Eliminate energy-draining garage clutter by ridding the space of items that no longer serve a purpose. Objects that are outdated, non-functional, redundant or rarely used harbour stalled energy and have a negative impact on your energy. Toss, repurpose or donate such items stored in your garage. It can be difficult to let go of items to which we have an emotional attachment. Knowing that donated items will benefit those less fortunate can be a powerful motivator to finally release unneeded items. Every item must have a purpose and a designated place. Order is an essential component of feng shui. However, it’s difficult to create order in your garage without a system for organizing your space. A garage renovation specialist can work with you to develop a garage design suited to the needs of your family. 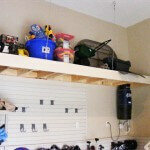 Wall organization systems that use corresponding shelves, hooks and baskets create a designated space for everything in your garage from bicycles and sporting equipment to gardening tools. 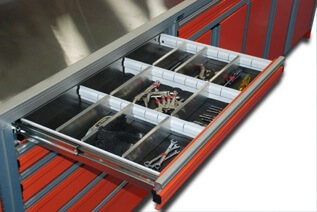 Lockable storage cabinets provide a safe, concealed space to store tools, household chemicals and other items. Park your car inside the garage—its designated space. People often treat their garages as a sort of “junk space.” In reality, the garage is the designated space for storing your car. Keep this in mind as you clean and de-clutter your garage and then assign each remaining item a designated space. If carving out space in the garage to park your car(s) feels impossible, consult with a garage renovation specialist who will design a plan for you. Finish the walls and/or floor with an energy-enhancing colour. Garages tend to be a dark, uninviting spaces, but they don’t have to be. The walls are often unfinished, and the floor of an older garage may be stained, cracked or otherwise compromised. Give your garage a cheerful facelift by incorporating colour. Feng shui recognizes the strong impact colour can have on mood and physical and emotional well-being. Incorporate relevant colours connected with the five elements of the natural world, listed earlier. Colour can be incorporated into the space through wall paint, fabric—like a colourful kite or flag—or by finishing the floor with an epoxy or polyaspartic floor coating, designed for garage and basement floors. Modular interlocking floor tiles offer a less permanent way to introduce colour into the garage floor. All three products come in a range of attractive colours. The floor coatings can be customised to achieve your desired colour. 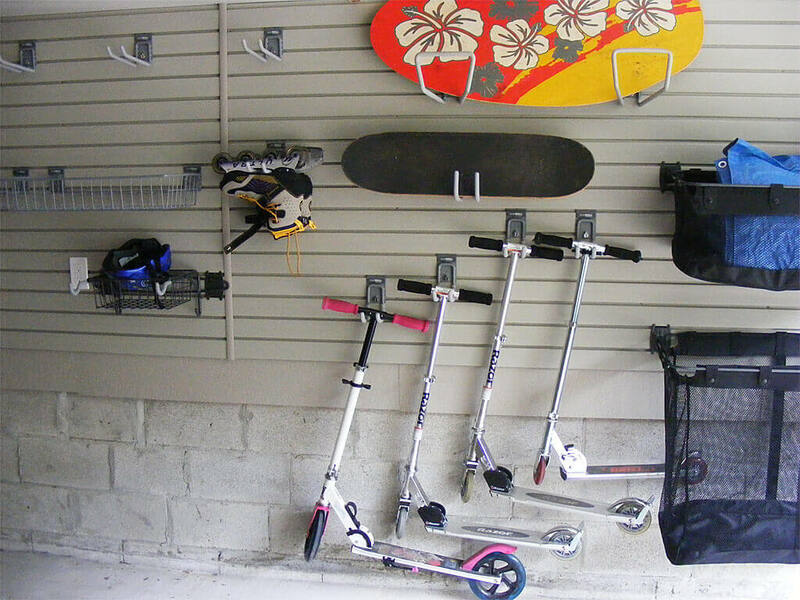 Make your garage an uplifting and inspiring space. Make sure to tackle all of your home and garage cleaning projects prior to New Year’s Day, as it’s considered bad luck to clean during the first few days of the New Year. Once that period has passed, you can attack any areas you weren’t able to finish prior to the start of the year. Are you ready to incorporate the elements of feng shui into your garage? Complete the garage survey form to tell us a little about your garage and schedule a no-cost, in-home consultation to discuss your specific garage needs. As the year quickly draws to a close, it’s the perfect time to recap some of our favorite garage renovation tips from this past year. Replace the batteries in your garage door openers. Check garage door weather stripping and replace, if needed. Check all moving parts of the garage door. Get a pro to repair damaged or malfunctioning parts. 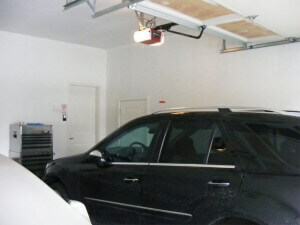 Lubricate garage door rollersand hinges to ensure smooth operation. Test the garage door safety reverse sensor. If not functioning correctly, adjust the sensors or have them repaired. Shut off water supply to exterior spigot. Tire racks–Specialized tire storage racks come in a variety of configurations, allowing tires to be stored vertically or horizontally, on a wall or overhead. Lawn mower racks or lifts – Riding and push mowers take up substantial garage space, making it difficult to park vehicles inside. Worse, vehicles can get scratched when the door is opened, or while the lawn mower is being moved.Lawn mower racks store push mowers off the ground, so additional items can be stored underneath. For a riding mower, a motorized lift will lift and lower the riding mower with the push of a button. Motorcycle lifts – Motorcycles often hijack space needed for the snow blower, or to park a second vehicle. A professionally-installed motorcycle lift can safely store the bike off the ground, reserving premium garage floor space. 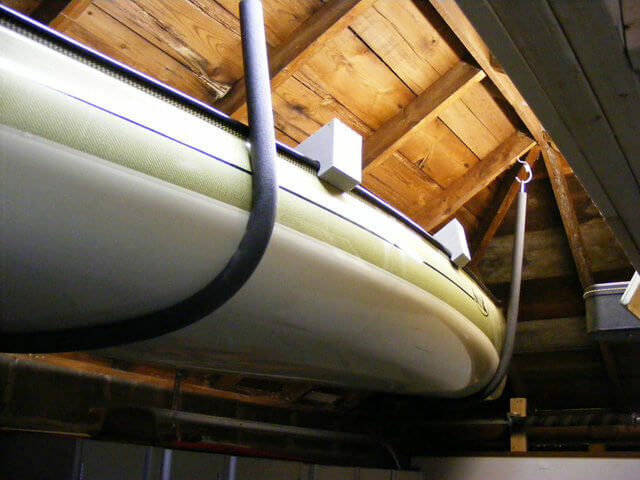 Kayak and paddle board racks – It can be tricky to find just the right place to store these seasonal items in your garage. If not properly stored, expensive paddle boards and kayaks are easily scratched or toppled. However, specialized kayak and paddle board racks provide safe, attractive storage for these items.Overhead, wall-mounted and freestanding racks are available. Many models can hold multiple boards/kayaks. 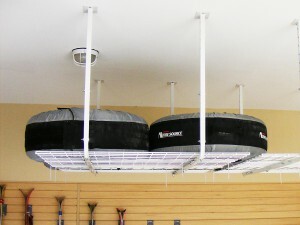 Overhead pulley systems – Canoes, truck caps and other heavy items which must be lowered onto a vehicle are excellent candidates for an overhead pulley system. Such a system allows users to lift and lower heavy items with minimal effort. 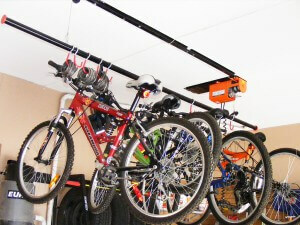 Pulley systems are also available for single, double or multiple bicycle storage. Baskets – Store balls, sports pads, household goods and other items in baskets. Create a separate basket for each task, sport or individual. Hooks – Use hooks to hang a wide range of items from gardening tools to sporting equipment, like hockey gear and bicycles. Shelving – Shelves fit into the grooves in slatwall, enabling heavy items to be stored securely. High shelving provides the perfect storage space for items that should be kept out of the reach of pets and children, like automotive fluids, household chemicals or flower pots. Specialty hooks – Many professional-grade garage wall organization systems offer specialty hooks for items like golf equipment, skateboards, snowboards and more. All hooks, baskets and shelves can easily be relocated, creating endless configuration possibilities. 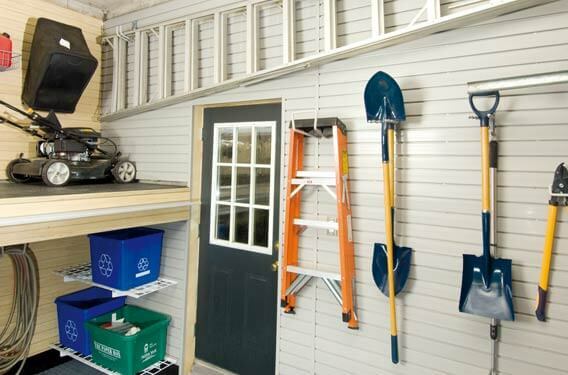 One of the keys to maximizing storage space in your garage is to find clever ways to make use of “unusable” space. Look around your garage. Perhaps you have high ceilings, oddly configured corners, poorly placed appliances and other dead spaces that create storage challenges. However, a garage renovation specialist can find creative solutions for such challenges, like custom-built overhead platforms; custom-built or customizable cabinetry; custom-built slings for storing canoes and rooftop sports equipment carriers overhead; and other custom-built options. Standing back and surveying a neat, organized garage almost makes the entire Saturday you spent cleaning it feel worthwhile. But what happens a week later, once the entire family goes back to using the garage as a dumping ground? The garage quickly returns to utter chaos. This often occurs because only one person in the family is charged with the responsibility of keeping it clean. Put an end to this cycle of chaos. Get the entire family invested in keeping the garage organized. If everyone contributes to the hard work of cleaning and organizing the garage, they are more likely to work toward keeping it that way. Explore these and other garage renovation and organization topics to ring in the new year with a clean, organized garage that will stay that way. In nearly every garage there are items that pose a serious storage challenge. Winter tires, luggage carriers, leftover siding, lawn mowers, snow blowers, truck caps, motorcycles and other bulky items command a huge chunk of the already limited real estate in a garage. This makes such items particularly difficult to store. Sports enthusiasts often have additional difficult-to-store items on hand. Paddle boards, kayaks and canoes and sports equipment carriers, like Thules, create additional storage dilemmas. 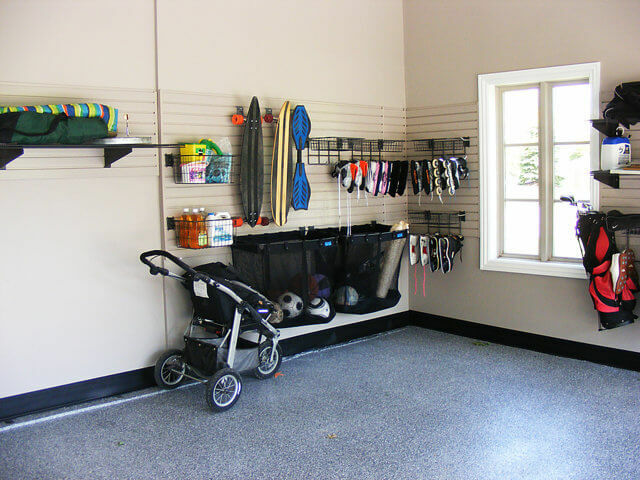 Many homeowners simply store bulky items on the garage floor perimeter. Eventually over-sized items can take over the garage, leaving one or more vehicles outside during cold, Canadian winters. However, with a bit of forethought, large, unwieldy items can be stored inside the garage while still leaving room to park vehicles. 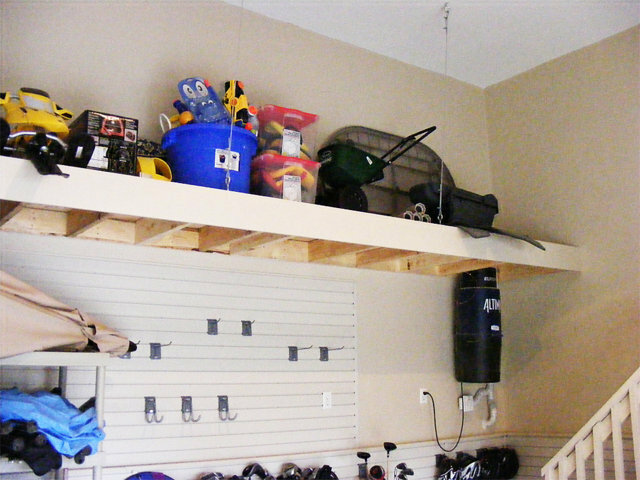 In response to homeowners’ desires for simple and efficient ways to organize their garages, there is a growing market of specialty items for this express purpose. Below are a few specialized storage solutions designed to store over-sized or bulky items. Specialized storage racks come in a variety of configurations, allowing tires to be stored vertically or horizontally, on a wall or overhead. To determine which tire rack is right for your space, first create an overall plan for your garage organization. Then choose the best space to install the tire rack. Tires should be stored horizontally, unless they are being stored in a rack that can store them vertically, while keeping them suspended to avoid flat spots. A set of tires can easily weigh eighty to one hundred pounds. Therefore, installing the rack securely is critically important. If not properly installed, your garage walls and ceiling can sustain unsightly damage. Make sure that the rack is installed by someone who understands how to safely install a shelf capable of bearing heavy loads. Both riding and push mowers take up substantial space in a garage, making it difficult to park vehicles inside. Worse, vehicles often get scratched when the door is opened, or while the lawn mower is being removed from or returned to the garage. Specialty racks allow lawn mowers to be stored off the ground, so that additional items can be stored underneath. This type of rack works best for a push mower. Upper body strength is required, since the mower must be manually lifted onto the rack. On the other hand, a motorized lift will cost more and should be professionally installed. However, lifting and lowering the mower will be as easy as pushing a button. Motorcycles can also damage vehicles if squeezed into limited garage space. During the cold winter months, a motorcycle stored inside the garage may take up space needed for the snow blower, or to park a second vehicle. A professionally-installed motorcycle lift can safely store the bike off the ground, reserving premium garage floor space. Kayaks and paddle boards provide a fun way to spend a hot day at the beach. Finding a place to store these seasonal items in your garage can be anything but fun. Boards and kayaks propped against the wall or around the floor perimeter can easily be scratched or toppled, posing a tripping hazard. However, specialized kayak and paddle board racks provide safe, attractive storage for these items. 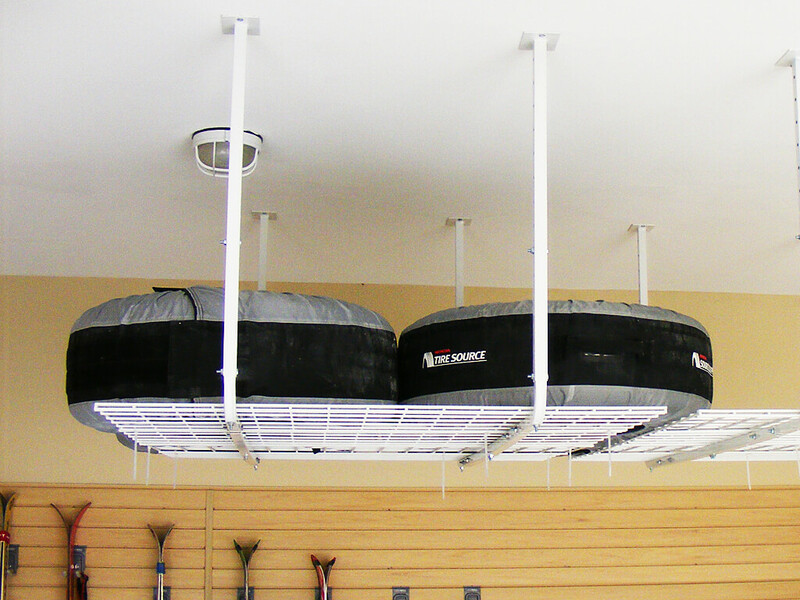 Kayaks can be stored in overhead or wall-mounted racks which can hold one or more units. Wall racks typically come in two styles: padded metal bars or straps which hold boards in place. Freestanding racks that hold multiple kayaks are also available. Stand up paddle board racks also come in several styles. Wall-mounted racks are made of steel and have a heavy padding to protect boards. Depending on the size and style chosen, a metal wall-mounted rack can accommodate from one to four paddle boards. Another option is a wall-mounted rack that uses heavy straps to hold one or more paddle boards in place. Lastly, simple overhead rack systems are also available to store one or more paddle boards. Canoes, truck caps and other heavy items which must be lowered onto a vehicle are good candidates for an overhead pulley system. Such a system allows users to lift and lower heavy items with minimal effort. To ensure that your system operates safely and will not damage your ceiling, have your unit professionally installed. Despite the growing market to accommodate specialty storage, there isn’t always a ready-to-buy solution available at your local home improvement or sporting goods store. Additionally, on-the-shelf storage solutions may not be practical for the layout of your garage. In such instances, customized storage solutions are required. A custom-built overhead platform or mezzanine provides the perfect place to store items used infrequently without sacrificing floor space. Store-purchased units don’t always accommodate your unique space or fit your specific needs. However, a custom-built, overhead storage platform offers greater possibilities and more flexibility. A garage renovation specialist will work with you to create a solution that meets your exact needs. There are a variety of pulley systems and slings on the market. Finding one that can safely accommodate your space and lifestyle can be a bit more challenging. A garage renovation expert who is experienced at building custom solutions can design a sling that meets your storage and use needs. Foam-covered, heavy-duty chains can be used to create a simple, effective sling suitable for lifting and lowering items like canoes, sports equipment storage containers and truck caps. Finding space in the garage for those hard-to-store items can present a challenge. Storing items around the perimeter of the garage floor eats up valuable space and makes it difficult to park vehicles inside. There are a variety of specialized and custom-built storage solutions for bulky items. Consult with a garage renovation expert to determine how to best integrate such solutions into your space. It’s that time of year again; time to move your tires in and out. Of course some choose to simply store their seasonal tires at an offsite location. However, a large majority choose to store their tires at home in their garages. At the same time, there are some homeowners who choose to do both, store the set of tires for one vehicle offsite and the tires for a second or third vehicle at home in the garage. 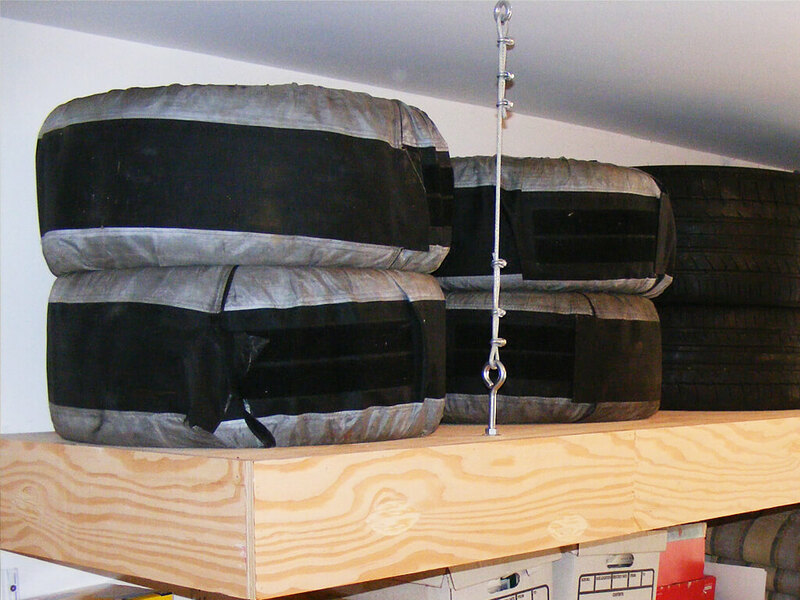 This article is for those who choose to utilize their garage space for seasonal tire storage. There are a few factors to consider when discussing tire storage. One of the most important issues you want to keep in mind is that of protecting the integrity of your tire. As you probably know, it is never a good idea to store the tire vertically in the same spot over an extended period of time. Storing a tire on its running surface (with or without rims) tends to leave a flat spot in your tire that may result in damage the tire. Another factor to consider is the weight of the tire. Obviously a seasonal tire with rims is significantly heavier than a tire without rims. Even so, the weight of a tire without rims may be a bit much for some people to hoist up to an overhead platform. You want to tailor your storage solutions to your situation, especially with bulky or heavy items such as seasonal tire. Tire storage options can be classified into two main categories: horizontal storage and vertical storage. Horizontal storage is exactly what it sounds like. You simply place your tires flat. The tires are either placed on a platform or they may even be stacked in the corner on the floor. Horizontal storage as an option applies to both tires with rims and tires without rims. Depending on your needs, you may decide you don’t like your tires sitting on the floor all winter and would feel much better if they were on a platform out of the way. Also remember that whatever tire storage solution you are pondering, at least moving them off of the floor frees up some more floor space for you to use. 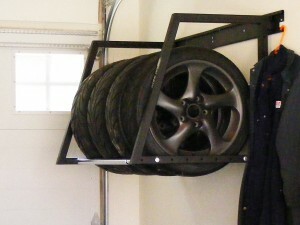 One space-saving solution to examine if it works for your garage is that of vertical tire storage. Storing tires vertically means they are installed in a rack. The rack is then conveniently mounted in an optimum location to maximize your other storage options while still allowing access to your tires. Note that vertical storage is available both for tires with rims and for tires without rims. If you are looking around your garage and want to know if a vertical storage rack would work for you, simply take 4 times the width of your tires, which is the lateral distance or width of the rack (plus hardware needs). Then, measure the diameter of the tire, that number is the approximate depth you will need for a vertical tire storage rack. As you can see, the vertical tire storage option gets the tires out of the way in a compact and contained space. Whichever option you choose for your seasonal tire storage needs, there is a storage solution that can fit your garage. When you decide to renovate your garage that is an excellent time to evaluate your tire storage needs and options. How much is a disorganized garage really costing you? Are you a Have or a Have Not? As you have probably noticed, it’s that time again. Yes, the days are getting shorter, the kids are back in school and it’s time to set up your garage for the winter season. In our many years of helping people organize their garages, we have identified two distinct types of homeowners in our area, the haves and the have nots. In this case, we are talking about homeowners who have taken steps to setup and organize their garages for easy seasonal transitions. These homeowners greet the seasonal change with open arms. They know that seasonal garage setup is not a chore at all, but a simple task that can be completed in a fairly short amount of time. On the other hand, there is the other group of homeowners, those who have not organized their garages. As you might guess, these homeowners warily glance around the inside of their garage. They desperately try to figure out how long it will take to gather up all that clutter, move all that stuff around, store all the summer tools, toys and more away and bring out the winter gear. Sometimes, these garages are so disorganized that homeowners actually consider taking almost everything outside and then bringing the stuff back inside in the order they need. Unfortunately, if they are honest with themselves, they know this will most likely never happen. The end result is chaos or worse. Then, once the first cold snap hits for these homeowners, it’s a mad dash to move the piles from here to there and everywhere in between to make room for the car. Oh, and should the home be equipped with a 2 car garage, too often, there is so much clutter piled up that just one car can be safely squeezed into the remaining space. The point is simple and easy to understand: an organized garage will save a lot of headaches throughout the year, but especially so when it’s time to adjust for the season change. Look, if you plan on just shoving your stuff into various piles around the garage that’s your choice. Yet, you might want to consider what a disorganized garage is really costing you. Of course, it’s obvious that a disorganized garage costs you extra time throughout the year. Do you ever find yourself hunting all over your garage for a particular garden tool? Do you ever move stuff aside to get to more stuff behind the first pile? Have you ever sent one of your kids out to the garage to fetch a garden tool and they can’t find it? Then, you head into the garage and it takes you a bit of time to find it yourself. You can see that you could end up spending a lot more time than necessary; if only your garage was better organized, you would save yourself a lot of headache. Another way a cluttered garage is costing you comes right out of your wallet. Our storage solution team members regularly surprise homeowners when they point out that the homeowner has two or more of the same item such as weed whackers, garden hoses or rakes, one of which was buried deep in a pile of clutter years ago. Or, in a more painful hit to your wallet, what about the car door that bangs into a wheelbarrow or other item in the garage simply because the garage is over stuffed with clutter. Whether a small dent or ding, the damage is unsightly and will most likely need repair. A third way that a cluttered garage can end up costing also concerns your vehicle. Think of it this way. Think about what happens if a garage is so cluttered that one or both vehicles (for a 2-car garage) can’t comfortably fit inside during the winter. A vehicle that’s worth more than everything in the garage combined has to sit outside and endure the brutal winter; but your garden tools, the lawnmower, the bikes, etc get to rest comfortably indoors. Of course, when you look at it that way, it’s immediately obvious there has to be a better way. Actually, it’s about this time of year the storage solution team here at Nuvo Garage starts to field anxious calls from worried homeowners. Remember, your garage is not just a dumping ground for what doesn’t belong in the house. Your garage is there for your vehicles plus your other belongings. With the right organization system in place, your car and your bikes, sports equipment, garden tools and more can comfortably occupy the same space. Slatwall is great for storing tools and equipment that you want visible, but it’s nice to also have the option of a place to keep things behind closed, and possibly locked, doors. Have a look at my blog on open versus closed storage. When it comes to choosing cabinets, all is not created equal. You can go to the big box store and purchase cabinetry and install it yourself, but you might not be thrilled with the finished product. Let’s talk about the benefits of professionally sourced and installed cabinetry. At retail stores, the choices are limited. You’ll either find fabricated wood, plastic or steel cabinets. Fabricated wood is not built to stand up to our Canadian climate. Plastic is not sturdy. It’s prone to cracking and just won’t hold up to long-term use. 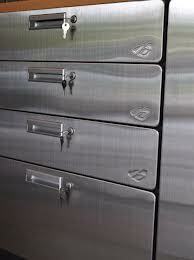 The steel cabinets available are a low-grade metal. Nuvo Garage offers three levels of metal cabinetry, which I call good, better and best. Hercke is basic but it is durable, functional and attractive. Onex is a mid-range customizable cabinetry, and CTECH is a beautiful, high-end, lightweight but extremely durable product. At the big box stores, what you see is what you get. There’s not much choice in colour, size or customization. The Hercke brand cabinets Nuvo Garage offers has the least flexibility in choice, but is still more versatile than the big box offerings. The big difference comes in the Onex and CTECH brands. Onex comes in 21 different colours and CTECH comes in 9 colours. But both can create a custom-mixed colour for you. Onex and CTECH are also highly customizable. Unlike standard big-box style fixtures, these professional brands don’t just stock standard sized cabinets. This is particularly useful as most garages are not a standard size or shape. The Onex and CTECH cabinets can be custom ordered to fit perfectly along the length of your wall without leaving that annoying 5 inches of unusable wall at the end. In addition, these cabinets can be customized with hardware, lighting, locks and workshop tabletops to enhance the functionality of a garage. Online reviews of the metal cabinet brand offered by the big box guys generally repeat the same complaints: They are attractive at first glance, but are flimsy metal, the screws don’t fit nicely and the finish stains easily. Hercke, Onex and CTECH are all made of very high quality materials. Hercke, the lowest cost offering, is made of high-quality steel that stands up to heavy use in the garage. Onex is also made of steel but is a lower gauge, which is even stronger. CTECH is aluminum. It’s not quite as strong as the Onex steel but it’s more than strong enough for residential use. Car enthusiasts are drawn to CTECH because of the quality in the design. Its look is derived from the world of professional car racing and provides a truly unique and stylish look to a garage renovation. 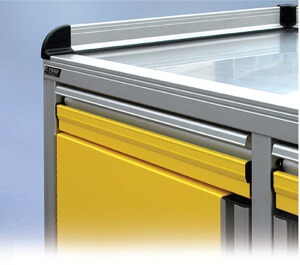 Also, little things such as the drawer closing mechanisms of a CTECH MotionLatch make your cabinet drawers much more enjoyable to use as opposed to low quality steel doors, which probably creak, shift and become a chore to close over time. Along with variety, flexibility and quality, another advantage of hiring a professional is we’ll arrange the delivery and installation of your cabinets. So, if you’re planning a renovation, do some research and consider your options. In my opinion, for the money, the long lasting quality, beauty and enjoyment of professionally designed and installed cabinets far outweigh the do-it-yourself option.